PROBA stands for 'PRoject for OnBoard Autonomy', which is part of ESA's in-orbit Technology Demonstration programme. Following up on the success of the first PROBA satellite, PROBA2 hosts 17 new technological developments and 4 scientific instruments. Among the platform elements and experiments demonstrated on PROBA2 are the new powerful ADPMS on-board computer, AOCS subsystems, highly integrated avionics and power units, a star tracker, Sun sensors, a propulsion subsystem, Li-ion batteries, reaction wheels and an advanced stellar compass. The science payload on-board PROBA2 consists of two main solar instruments (SWAP and LYRA) and two instruments to observe the space environment in the immediate vicinity of the spacecraft (DSLP and TPMU). 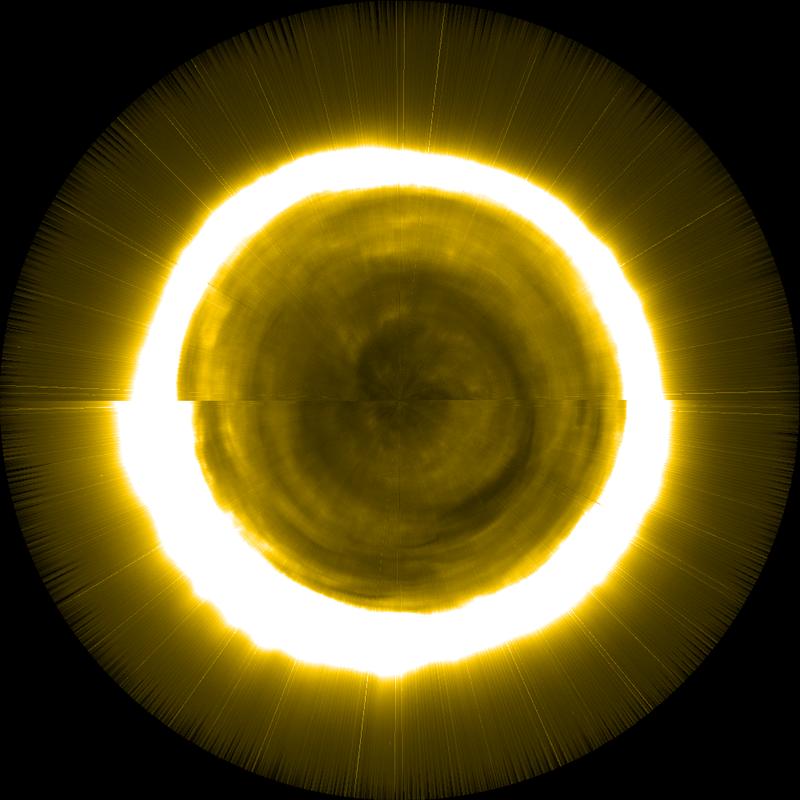 The aim of these instruments is to identify and study all events on the Sun that might have implications on the solar-terrestrial connection, both through imaging (SWAP) as well as through irradiance measurements (LYRA). 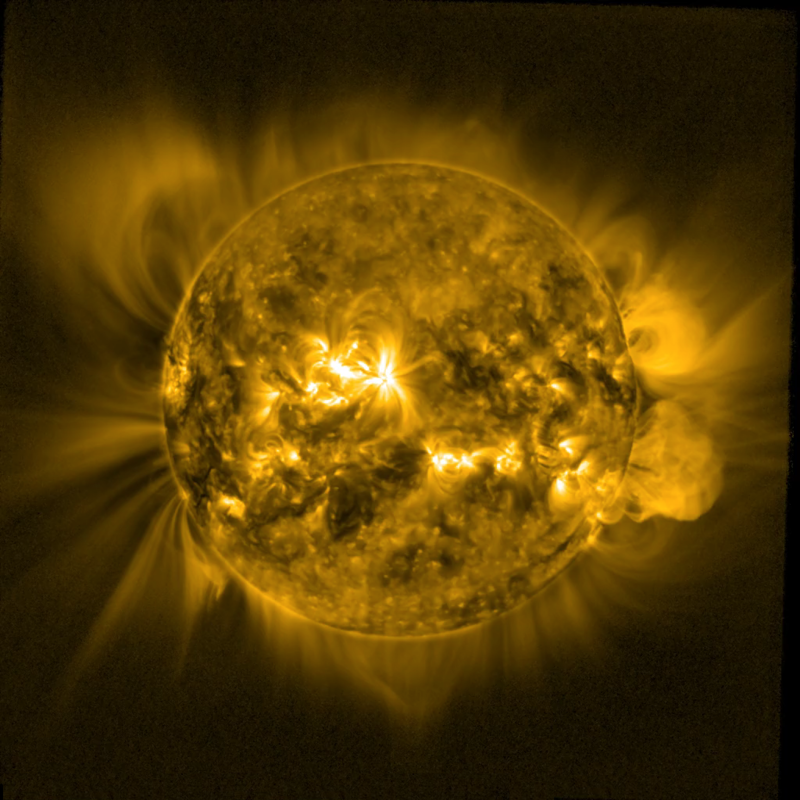 In particular, the focus of the PROBA2 mission is the genesis and evolution of events that can affect space weather, such as coronal mass ejections, EUV waves, EUV dimmings, and solar flares. 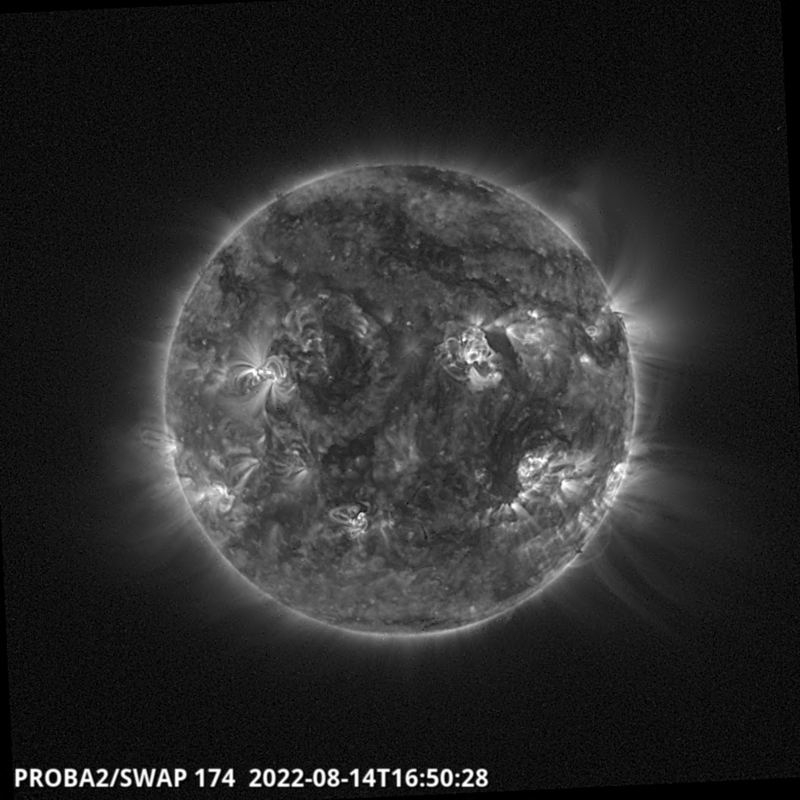 However, PROBA2 also provides wide-field observations of the large-scale evolution of the solar corona and the long-term variation of its spectral irradiance. Both instruments are hosted at the Royal Observatory of Belgium (ROB). Visit Dates. Although we welcome guests at almost any time, it’s best to contact us before making any commitments to ensure those with whom you hope to collaborate are not traveling or on holiday and that accommodations, either in local B&Bs, hotels, or the Observatory’s guest rooms, are available during your proposed visit. Planning. We are happy to help to coordinate your visit with other European travel, but we do expect that the priority of trips paid for by the GI program will be the GI visit. To keep the logistics manageable for the PROBA2 team, we ask that you plan your GI visit (or visits) during single block periods. Short interruptions in your stay to allow for collaboration, talks, or seminars at other Belgian institutes are rarely a problem, but multiple-day trips should be planned either before or after your GI stay. Note you will need to make arrangements on your own for additional travel outside of your stay at ROB, particularly if you need a visa for your visit. Arrange to stay in the Observatory’s guest rooms. These rooms are basic - you have been warned! However, they are available free of charge. The rooms are equiped with a small writing desk, a small fridge and access to the GI office and a small kitchenette. Bed linen and towels are provided and changed regularly by the cleaning staff. There is also a small bathroom with wc and shower. The rooms are available on a first come first served basis. To ensure availability, please contact us as far in advance of your trip as possible if you would like us to arrange an ROB guest room for you. A particular advantage of staying in the ROB guest rooms is that you will receive an electronic key that grants you access to some of ROB’s facilities during off-hours. If you would like to do some of your GI work outside of normal working hours (roughly 8 AM to 6 PM, weekdays), we strongly recommend you stay in the Guest Rooms. Note that it is not normally possible for someone to receive you and let you in to the ROB guest rooms outside of normal working hours, so we strongly recommend those who decide to stay in the guest rooms arrange to arrive during normal, weekday hours. If a weekend or late-evening arrival is absolutely necessary, we recommend that you plan to stay in a hotel until the next weekday (working day) morning. Don’t forget to factor the cost of such a stay into your GI budget allotment. Stay at a B&B or hotel. This option should be discussed with the group secretary so that ROB can book and pay directly. If you choose this option you will not be able to use the Observatory out of hours or on the weekend. Visa. Once you have selected your travel dates it is best to sort out travel arrangements and a visa (if required) promptly. If you supply us with your exact dates we can send you an invitation letter for your visa. Be aware that this can take some time. Travel. There are several options for travel depending on your geographic location.If you have another method of transport please let us know and we’ll do our best to help with any logistical questions you might have. It is also best to take a member of the team’s telephone number (see Appendix A) just in case you run into difficulties on route. A local area map is shown in Figure 1. When you get to a big station, such as 'Gare Midi', 'Gare Nord' or 'Gare Central' it is advisable that you purchase a Mobib card from one of the manned ticket offices. This will give you a reduced fare on buses and trams. If not you will have to buy individual tickets for each journey which can be very costly. emeber to pick up a receipt for reimbursement. For those travelling by car are advised to check the latest maps, or direct your GPS/online map service to “Ringlaan – 3 – Avenue Circulaire, 1180 Brussels, Belgium”; GPS coordinates: 50.799263, 4.358726. You will be heading to the south of Brussels and the Uccle area. Gare du Midi is the station that provides the most convenient access to the Observatory that is directly served from the airport. When you first arrive it is easiest to take a taxi to avoid getting lost, however there are public transport options from Gare du Midi. The Tram station is located on the lower levels of Gare du Midi, where you will be required to buy a ticket to go through the barriers to board the tram. Note that there can be large queues for the ticket office, and not all ticket machines accept Visa credit cards. The easiest route by public transport is to take the number 4 Tram from Gare Midi toward Stalle, and get off at the tram stop ‘Héros/Helden’ where you change for the 43 bus in the direction of Observatoire/Sterrenwacht. When you alight at Héros for the bus, you will have to cross over two busy roads to catch the 43 bus. Beware that although you have right of way on pedestrian crossings but not all cars stop for pedestrians, tentative steps are sometimes required! Luckily, the 43 bus terminates at the Observatory so the stop is hard to miss. If in doubt, look for a taxi, and do not forget to ask for a receipt so you can be reimbursed. It should also be noted that pedestrian crossings should be used if available, and you may be punished with a fine from the police if one is approximately 30 meters away and you do not make use of it. For those travelling by Eurostar, you will arrive at Gare du Midi and should follow the instructions listed in point 2 above. For those travelling by aeroplane, Brussels is served by two airports, and visitors should take note of which airport they will arrive at. Brussels International is the main airport serving Brussels, and is the most convenient, located in Zaventem, just outside of Brussels. On arrival you will be presented with a couple of options to get to the Observatory. You can take a taxi or take a train to Brussels. Please note that a taxi will cost around 60-80 Euros and should be factored into your expenses, as should a hire car. The train to Brussels will cost about 8 Euros and will take you to one of the central stations in around 20 minutes. Gare du Midi is the most convenient and almost all airport trains stop there. You should note that the train is likely to make several stops in Brussels before reaching Gare du Midi. On arrival at Midi follow the instructions listed under point (b) above. It is worth noting for the return trip, if you decide to take a train to the airport and use the automated ticket machines, the national airport stop is sometimes listed as Zaventem, Brussel Nat Aeroport. Computers. Public WiFi is available at ROB. We will arrange a username and password that will give you access to ROB’s public WiFi. To arrange access on arrival you should send you MAC address to us a few days in advance. Be advised that internet access at local hotels and B&Bs is variable. The Royal Observatory is located in the South of Brussels. It is one part of the Belgium Space Pole which consists of the Royal Observatory, the Royal Meteorological Institute and the Belgium Institute for Space Aeronomie. Assuming you arrive at the Observatory without any issues, you will have to report to the office at the entrance, where you will be able to contact a member of the team or the group secretary, who will come and meet you. A rough map of the Observatory is shown in Figure 2. The PROBA2 science team Guest Investigator office is currently located on the ground floor of the same building in which the guest rooms are located. However, this may be subject to change in the future, and it might be best enquire of its availability before you arrive. The PROBA2 Science Center is currently located on the upper floors of the so-called “Radio Astronomy” building near the guest rooms. The PROBA2 Science Center is indicated on Figure 2. If you choose to use the guest rooms, a 20 Euro deposit is required for the key, and you will be expected sign for the key on arrival. As mentioned above, those using the guest rooms are advised not to arrive on weekends as staff may not be present to give you the key or welcome you. If arrival during weekends is unavoidable, prior arrangements should be made. We ask all GIs to present a brief overview of their intended research for the PROBA2 team when they arrive. 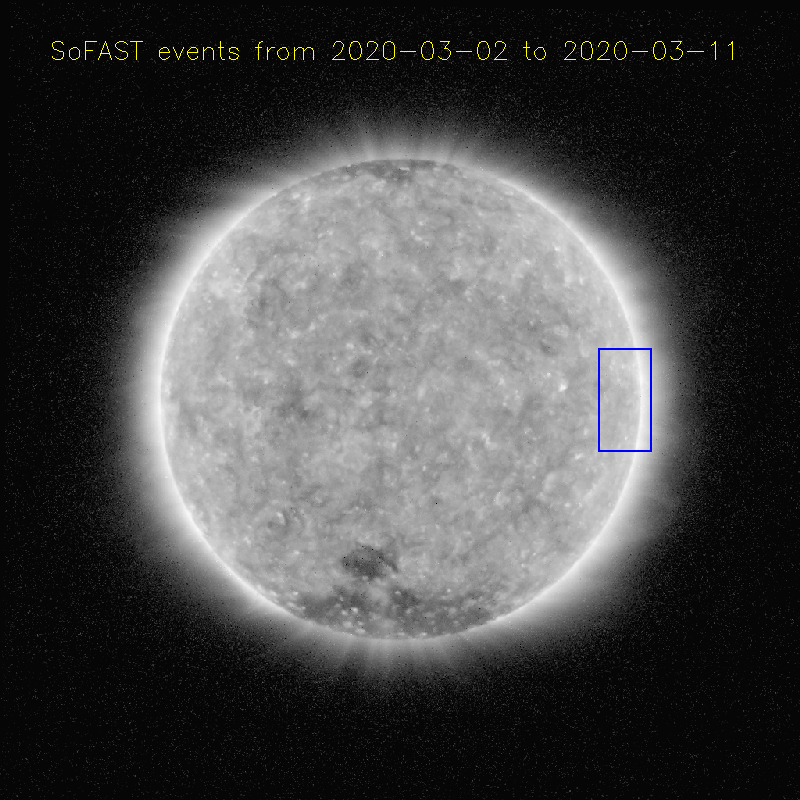 Typically we try to do this within a day or two of your arrival, in conjunction with a brief introduction to the PROBA2 spacecraft and scientific instruments by the PROBA2 team. We try to arrange for GIs to present their research progress before leaving the Observatory, which provides a good opportunity for discussion and feedback on the work you have done, and may spark interesting directions for further research when you return home. Both of these presentations are generally informal discussions, rather than formal seminars. For those who wish, we can also arrange an opportunity for a more formal seminar or presentation to the entire Space Pole community. Please let us know when making your travel arrangements if you would like to give such a seminar. Figures 1 and 2 highlight several points of interest around the Observatory. The buses 38 and 60 are convenient for going to Brussels city center and the 43 can be used together with the tram (change at Heros) to get to Brussels city center. Bus tickets are cheaper if bought prior to travel and can be obtained at some tram stops or the local Delhaize supermarket (at desk to the right of the entrance). It will cost 2 Euros for a single ticket or 13.50 for a 10 journey pass (as of June 2013). Once a ticket, or one journey on a 10 journey pass, has been activated, it can be used for 1 hour on buses, trams and metros throughout the Brussels. Each time you enter a new bus or tram (not metro) you should locate the small orange ticket box and insert your card, even on multiple journeys. There are ticket inspectors working in Belgium, and a ticket should be carried at all times to avoid a large fine. Whenever guests enter and leave the site they’re required to sign in. There is a registration book located in the main corridor next to the central stair well. If you need to do laundry, there is a launderette called Mega Wash at Chaussée de Waterloo 1159D, 1180, Uccle. There are many other launderettes located around Brussels and likely one closer to your hotel. If you choose to stay at the Observatory guest room there will be a small kitchenette with fridge, stovetop, and microwave at your disposal. 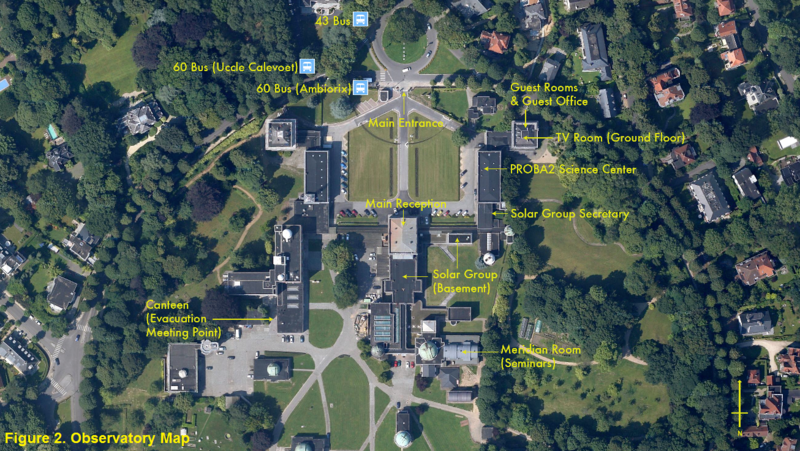 Both a Delhaize supermarket and cash machines are located 5 minutes walk from the front of the Observatory. There are a number of good restaurants within a 15 minute walk of ROB, and there are several sandwich shops available for lunch just down the street, these are indicated on Figure 2. The website www.resto.be provides a very good overview of restaurant options in the neighborhood and throughout Belgium, often with menus and online reservations (but not all content is available in English). If you are sick during your stay there is a hospital located on Avenue De Fré (Sainte-Elisabeth; See Figure 1), and a small pharmacy located oposite the Supermarket, also on Avenue De Fré (No. 179). The Observatory offers a small canteen, but it is necessary to pre-arrange tickets and a reservation at least a day in advance if you wish to eat there. There is generally a choice of two menus, both offering hot food. 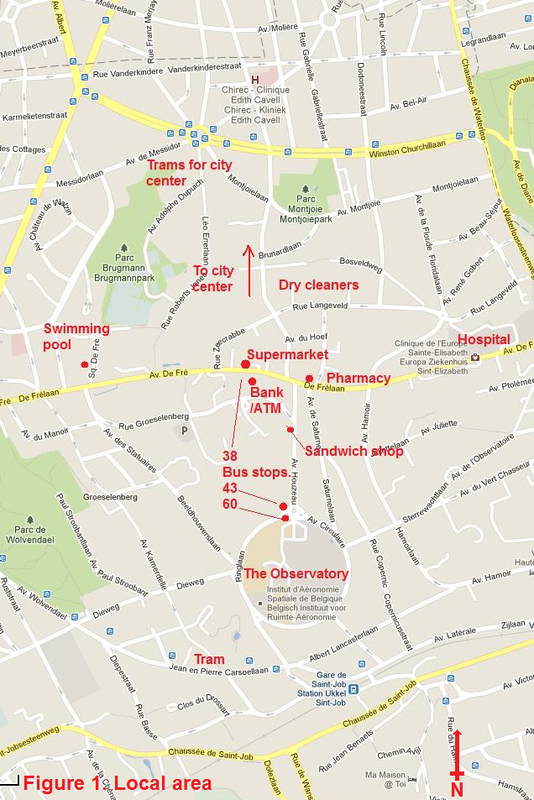 However, it should be noted that the majority of the group use the provided common areas for home-cooked lunch, or sandwiches purchased from the local sandwich shop, which can be located on the enclosed map. We endeavor to repay costs incurred before you leave the Observatory as this prevents delays and inconveniences for both parties. This should be discussed with the secretary before departure so that the appropriate forms can be filled and submitted. On the rare occasion when there is a fire/fire drill the meeting point is located in the staff canteen, which is indicated on the contained map. At the Observatory we're unable to offer personal or property insurance for external visitors. Therefore, we ask all guests to make personal arrangements. At the Observatory each guest will be offered a seat in a office, which may or may not be hosting other guests. The door will have a lock, however it might be prudent to take any extremely personal items when leaving the room, or locking them in a cabinet. It is also worth backing up your data before your arrival. Finally, the PROBA2 GI program usually offers a per diem of money for everyday expenses, this should cover food and sundry costs. For other expenses, such as transport to and from the observatory, receipts will be required. It is very difficult for us to reimburse GIs without receipts, so please ask whenever possible. With this in mind it is recommended that GIs use public transport or taxis rather than personal cars, as a receipt can be issued. It should be noted that choice of transport should reflect the remaining money available in your grant. When you finish working at the Observatory you are expected to submit a report on the work you have conducted during your stay. This report should be sent to matthew.west [@] observatoire.be.